Nothing beats this Chocolate-Almond Mini Torte for topping off a celebration. Whipped cream and chocolate ganache fill the layers and cover the top. I made this torte during our first year of marriage when I was anxious to impress and willing to try baking anything we could afford. It was a winner and has always been one of my mom’s favorites. In the past, I used four 8-inch cake pans. It produced a cake big enough to feed 47 and 1/2 people, or if you really want to know, 8 people and me–for 10 days afterward. Not good. Then I discovered 6-inch cake pans, and I started cutting my cake recipes in half. It’s a new philosophy you can read about here. So this is half the original recipe, adapted from an old Southern Living cookbook I gave away long ago. If you don’t already have the smaller pans, check the internet, a restaurant supply or a crafts store in the cake-baking section. If you are thinking they are too expensive, consider how much you would pay to lose 5 or 10 pounds. (I ask myself this question often when considering the financial aspect of buying something that will help me be healthier, e.g. a gym membership or a vacuum-pack machine so I can pack salad in a jar ). Are you sure it’s not worth it? The cake itself requires only one bowl to mix the batter. I use a portable mixer since it’s quick to pull out and easy to wash. When chilled, the texture is rather fudge-like. The chocolate ganache is a recipe I borrowed from Dorie Greenspan’s Baking. 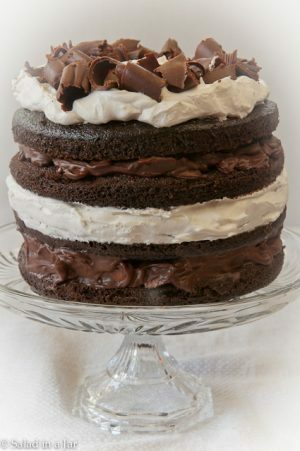 Please note the amount of ganache is probably more than you need unless you substitute the ganache for the whipped cream between the second and third layer. That’s not a bad idea since the layers with cream in between want to shift when you try to slice it. Regarding the cream layer: fresh, sweetened whipping cream is the best, but frozen whipped topping such as Cool Whip holds up better if you want to make it a day ahead–which I recommend. Preheat oven to 350 degrees. Prepare 4 pans by cutting waxed paper to fit into the bottom of each 6-inch cake pan. Break chocolate into small pieces and place in a medium-size mixing bowl. Heat water and butter in a 2-cup pyrex cup for 1 minute, 30 seconds in the microwave or until it starts to boil. Pour over chocolate pieces and allow to sit until chocolate is melted. Sift flour, cocoa, sugar, soda, baking powder, and salt together. Use a hand mixer or whisk to mix melted chocolate mixture until smooth. Add sifted dry ingredients and continue mixing. Add vanilla and then eggs--one egg at a time, mixing well between each egg. Pour 3/4 cup batter into each pan. Bake in 350 degree oven 12 minutes or until a toothpick comes out clean. Allow to cool about 10 minutes, then turn cake out onto cooling rack. Pull waxed paper off the bottom. Break chocolate into small pieces and place in heatproof bowl. Heat whipping cream to a boil and pour half over the chocolate. Allow to sit 30 seconds to melt chocolate. Stir in small circles, slowly, starting in the middle and make bigger and bigger circles. Pour in the rest of the cream and stir until mixed in. Stir in soft butter (divided into 4 pieces) one piece at a time. Add almonds and stir until mixed. Refrigerate until thickened--approximately 15-20 minutes. Spread ganache on top of the first layer. Place second layer of cake next and cover with whipped cream (or ganache if you prefer). Now place third layer, more ganache, and finally, the fourth layer. 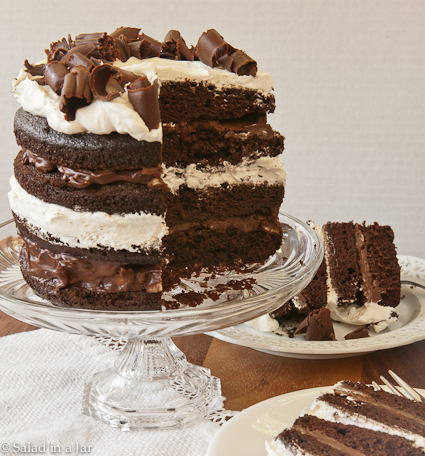 Cover top layer with whipping cream and garnish with chocolate curls, if desired. Chill at least a couple hours before serving. Hi Paula Cake looks amazing. The amounts for water and butter have a or seem to be blocked out, is it a cup for each. CAn’t wait to make it. Sorry. I can see it on my computer. Perhaps it doesn’t print out. At any rate, it should be 2/3 cup water and 1/3 cup butter. Enjoy! I love this idea of the smaller pans. They will be on the shopping list. However, I don’t think I could use Cool Whip (White chemical fluff… Sorry, to those that like it) On something so perfectly natural. But if you wanted it to last longer one could opt for a stabilizer added to the whipping cream. Just a thought and it can be found were you would buy the cute little 6 inch pans. I am sorry your son is moving, I totally understand, my youngest lives in VA, while I am in CA. I have a grandson I have yet to met. One thing after another has prevented the trip out there. Happy a Blessed Easter and as always thank you for the recipe. Stunna! How did you creat such impressive chocolate curls? Beautiful cake. I love the small size. Sorry to hear that your son is moving away, but I’m sure that there will be new adventures for all of you. Uhh, YUM. I need to get me some of those 6″ pans. All I have are 8″! Oh, Paula, I’m sorry to hear your son is moving, I totally understand how hard it is! This dessert looks amazing! It’s like the tower of Pisa but it’s totally straight and perfect! It’s making my mouth water! I just took 3-6″ round cakes out of the oven. I love these smaller cake pans and they are perfect of those who enjoy cake every now and then but don’t want a full size one. Your torte looks delicious. Love chocolate and almond anything! What an absolutely stunning cake! I hope the times you can have a family get together the coming three years will be extra special and wonderful to help you with the time in between when you have to be apart. If you don’t use it already, do get into Skype. It realy helps! Amazing, Paula! Amazing! And very inciting standing so tall with chocolate curls on top. Sorry to hear about your son moving so far away. Those visits with far-away kids are never long enough or frequent enough.